Federal Reserve Bank of Minneapolis President Narayana Kocherlakota discusses interest rates, the dollar, the job market and his economic outlook. 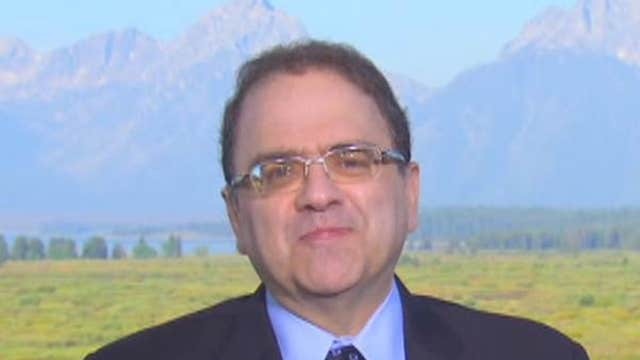 Narayana Kocherlakota, chairman of the Federal Reserve Bank of Minneapolis, said in an interview with FOX Business Network’s Liz Claman that policy makers should maintain near-zero interest rates this year and consider the possibility of additional quantitative easing. Wall Street is closely watching the Fed and its members for any clues as to when the FOMC will vote to hike interest rates. Economists have anticipated the move to occur at the September meeting, but after global jitters fueled extreme market volatility over the past week, those projections are up in the air. Still, most economists believe the Fed will take action at least by the end of 2015. Kocherlakota told FBN that because inflation remains below the Fed’s target, the central bank should avoid raising rates for the time being. The Fed is targeting core inflation of 2%, while the latest figures say it is running at 1.2%. “I don’t see us getting back to target for a few years. So with that outlook, I think it would be inappropriate to remove accommodation in the near term, really through the course of the calendar-year 2015,” Kocherlakota said. He suggested that the second half of 2016 might be a better time for a rate hike. “I’d certainly contemplate the use of those tools,” he added. Kocherlakota, who dissented when the central bank ended its bond-buying program in 2014, does not belong to the Fed’s FOMC policy-setting committee and therefore does not have a vote this year. He plans to step down from the Minneapolis Fed when his term ends in 2016. “I think given our price goals [and] our employment goals, [the Fed] should be doing what it can to facilitate that further improvement. We shouldn’t be satisfied with where we’re at,” Kocherlakota added.